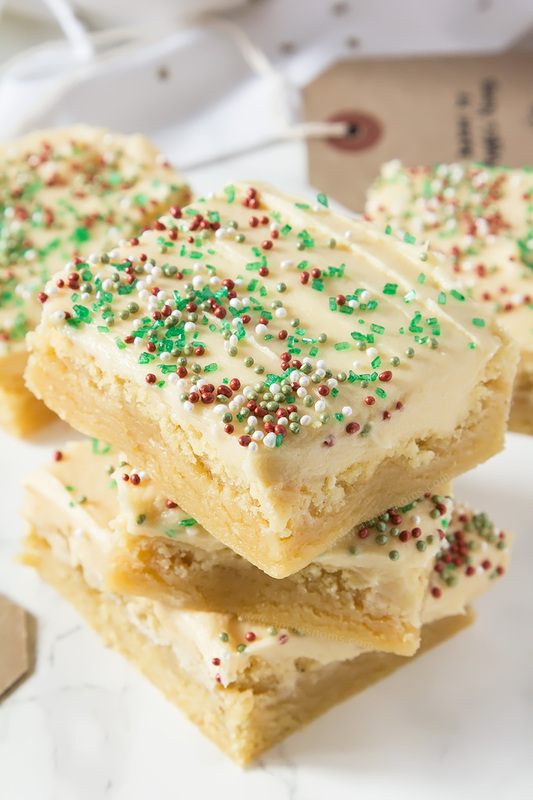 Thick and chewy Sugar cookie dough baked into bars and frosted with velvety smooth buttercream and festive sprinkles! Hello there; how is your week going? What are your plans for Christmas? My Christmas is going to be full of food and family and for once, I don’t have to bake for the blog, which is going to be so nice! 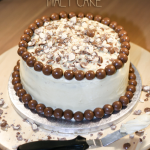 As much as I love baking and working on this blog, sometimes it’s nice to just bake for fun! 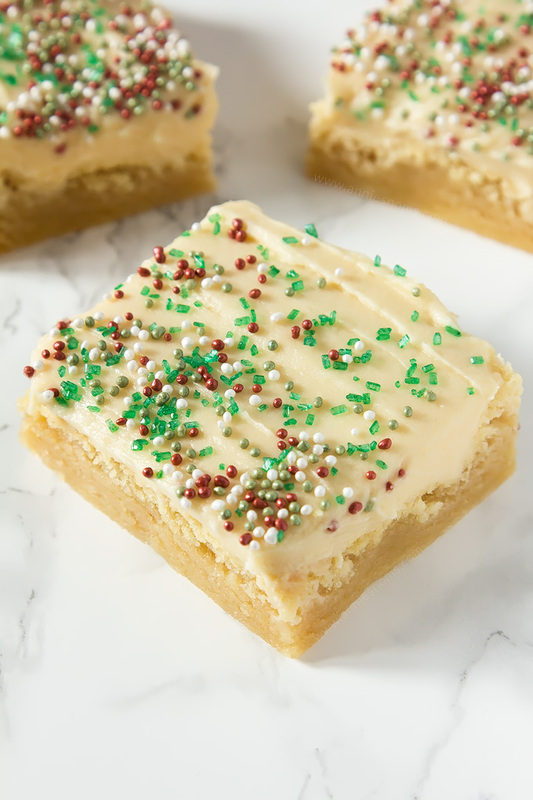 BUT, before all that starts, I’m dropping in to share these festive Frosted Sugar Cookie Bars with you; there is no chilling with this recipe, which means you can be eating them in about one hour. These also make a nice change for what cookies to leave out for Santa! Why the heck not leave out Sugar Cookie Bars?! I don’t see a reason you can’t! You know what?! This is the FIRST time ever I’ve made Sugar cookies. Oh my goodness, after tasting these beauties, I am now wondering why it has taken me so damn long. 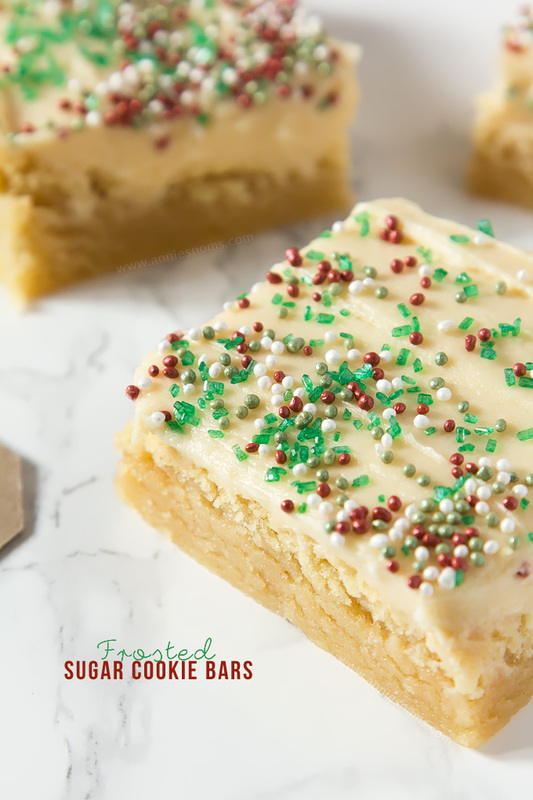 I’ve had these Sugar Cookie Bars on my “to-bake” list for so long! But, there are always sooooo many cool ideas floating around my brain certain things get pushed further and further down the list! However, I finally got round to developing my basic Sugar Cookie dough and it is not to be missed! Soft, oh so chewy, buttery and sweet, these are so addictive I could not stop picking at them! I topped them with sweet, smooth vanilla buttercream and tons of Christmas sprinkles because who doesn’t love sprinkles? I can’t even believe how easy these are to make. 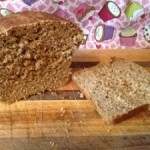 All you have to do is prepare the dough, which is a cinch with a mixer and press the dough into a greased 8×8 inch pan. Bake them until very lightly golden and puffy and then leave to cool. 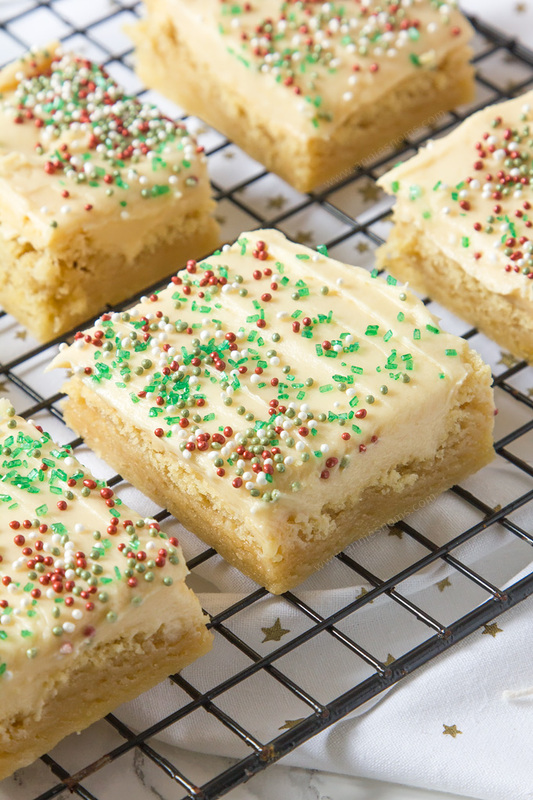 Once cool, you whip the buttercream up, spread it all over the top of the sugar cookie bars, go mad with sprinkles and then slice them into 9-12 bars. The final thing to do? Devour them. I didn’t think it was possible, since these don’t have chocolate, but these may just be my new favourite cookies. They are so easy to make and use simple ingredients I bet you already have in the house! 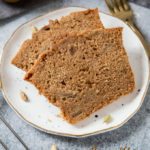 I’m also categorising this as a Back to Basics recipe because with just a change in sprinkles, these could be Sugar Cookie Bars for any occasion. The base dough wouldn’t need to change, but of course you can add any spices/flavourings/chocolate etc. you want! So, if you need a super quick, easy recipe that tastes utterly divine this Christmas, then these bars are for you! Sprinkles to garnish; I used red, green and white sprinkles to make these festive! Place butter and sugar into a large bowl, or the bowl of your stand mixer, and beat until light and fluffy. Around 2-3 minutes on medium-high speed. Add in egg and vanilla extract, scraping down sides of bowl as necessary and mix until well incorporated and smooth. Add in the flour, baking powder, bicarb and salt and mix on low until the dough just comes together. It won't be light and fluffy like a normal cookie dough, but if you pick up a chunk of dough and press it between your fingers, the dough will hold together. Tip the dough into your prepared pan and press into a level layer using a spatula/wooden spoon or your hands. I used my hands as I found it easiest! Place in the oven for 15-20 minutes, until puffy and very lightly golden all over. Cookie bars will also feel slightly firm to the touch. 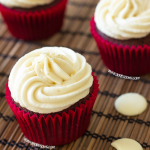 Leave to cool in the pan completely, before transferring to a cutting board, then make the frosting. 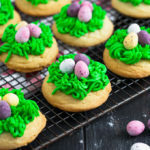 Place butter, icing sugar and salt into a large bowl, or the bowl of your stand mixer and beat on low at first until sugar begins to incorporate. Then turn the mixer to high and beat until light and smooth. Add in vanilla and milk, if required, and mix until smooth and light. You want it to hold its shape, but be soft enough to spread. Spoon the frosting into the centre of the slab of cookie and use a small angled spatula to spread and smooth all the frosting over the cookie bars. Sprinkle whichever sprinkles you want all over the frosting and then slice into 9-12 bars. I find it easiest to use a pizza cutter to cut the cookies into bars. 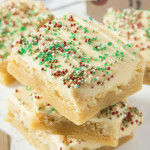 Frosted Sugar Cookie Bars will keep in an airtight container, in the fridge for 5 days, or at room temperature for 3 days. 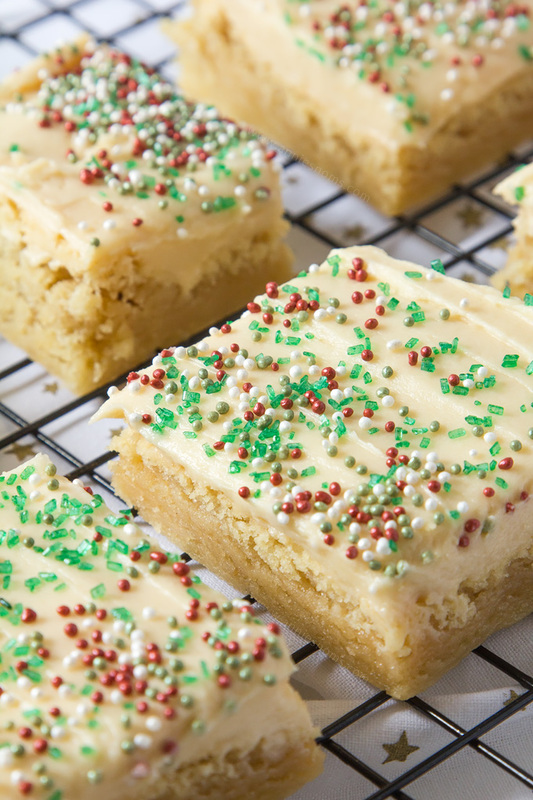 Yum- sugar cookie bars are the best! Thanks for sharing! These look so perfectly chewy! I pinned it for later! Gosh those look good! I bet these are really good! These cookie bars look so scrumptious! Especially with the vanilla frosting, and sprinkles! Just kidding–so excited to try this! Thank you! Gosh, the pictures made me drool! The recipe sounds so delicious and smooth. 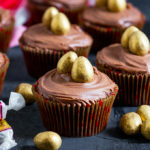 These look so festive and delicious! Enjoy the holidays with your family and good thing you won’t have to be baking for the blog!! Everyone earns the holidays off! I’m wondering if you tried one without the frosting? 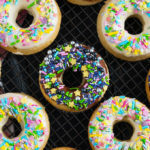 I’m not a big frosting fan, but this recipe looks heavenly! Do you think they would work without the frosting?